Helen Kempster, the Funeral Arranger at Chertsey branch, recently celebrated a decade of service with Lodge Brothers. Helen joined the Company in December 2004, and after three months training she took over the running of the branch in Chertsey. Over the years she has become a well-known member of the local community. 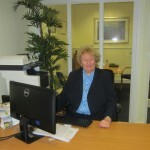 After 37 years service working for HSBC bank in the city of London, Helen retired and sought a new direction. She now lives in Hampshire and so has a 45-minute commute to Chertsey, but makes the trip daily to support her families in their ‘hours of need’.